The time finally arrived, and the mom car, the small SUV now graces my driveway. It's shiny. It's a smooth ride. It has bluetooth capability. My son says he can "smell my car" (oh, Buddy, that new car smell is one most of humanity enjoys), and I can fill my trunk with all of my Costco items with no fear of squishing the bread or breaking the eggs. Still, after ten years with my Honda Civic, it was hard to say goodbye. That's longer than I've known my husband. This was the end of a serious long term committed relationship. 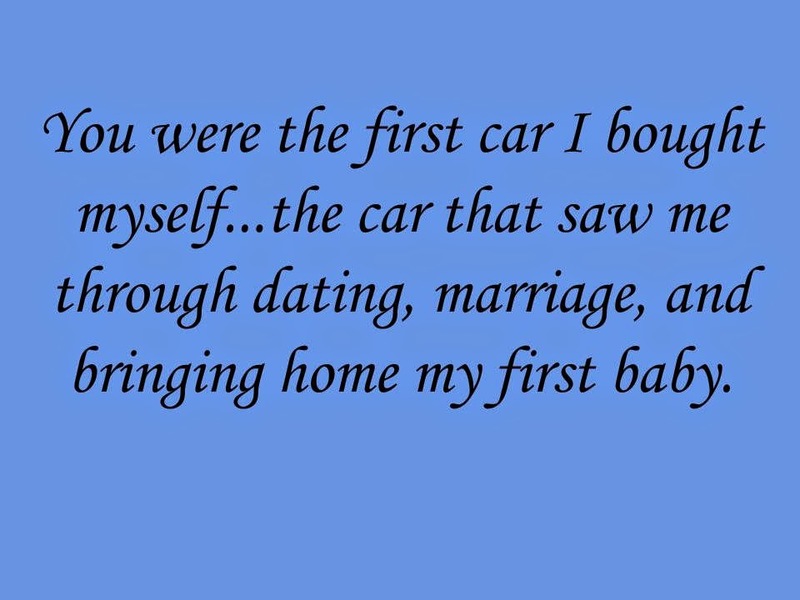 You were the first car I bought myself. I had some pretty sweet rides, from the Chevy Nova I learned to drive on to the Camry station wagon that got me through most of college, but this was the first car I chose and paid for myself. This was my first grown-up purchase. You got amazing gas mileage. Yep, a little four-cylinder sedan got over 30 mpg, and I didn't even have to pay hybrid prices. I know I could still have that in a new car, but I don't...and I'll miss those "cheap" fill-ups. You didn't let me know You had an in-dash CD player, and you started...everyday. That was a big deal for me after months of car trouble before finally breaking down and buying a new car. You had some pep. While I had just come from a V6 with some serious, though unreliable, power, you sounded like a race car (at least to a, shall we say, cautious driver, like me), and that made driving fun. You saw me through milestones. From commuting to grad school to driving to Napa to date my (now) husband to bring home our first child from the hospital, you were there, getting me safely home. Especially when I first drove you with my newborn son inside, I felt safe and secure, and there's no replacement for that feeling. And so, I bid you adieu, little Honda, or "Mommy's blue car," as my little guy called you. I hope you have fun darting around the freeway with your new driver. Thanks for sharing your story. Our relationship with our automobiles is like no other. They don't curse at us they don't talk back to us and they never complain about how far we drive them. I remember how difficult it was to give up my car after just seven years. It's kind of like losing a family member. It really is like passing on a family member to someone else!